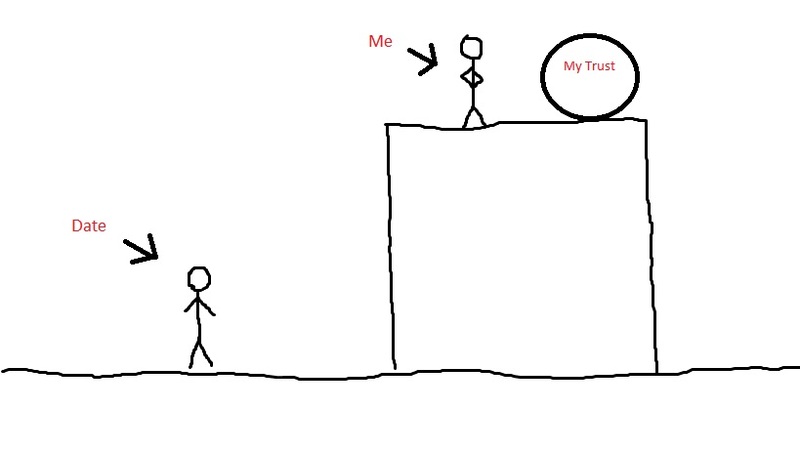 Hi, my name’s Sarah and I have trust issues. Not the worst problem in the world by any means, but not great. It has a history of effecting my personal life, though. I tend to keep my walls up for too long and then let them come crashing down entirely all at once instead of gradually. This leads to distancing, constant doubts, and fear of abandonment that comes with assuming people can’t be trusted or trusting too soon. Building high walls because some people violated your trust in the past isn’t fair to those perfectly trustworthy people you’re just getting to know. And letting your boundaries come crashing down all at once instead of giving trust in little bits at a time is setting yourself up to get hurt. So how can you get past our trust issues?Everyone’s different, of course, and if your issues are really bothering you, seeking help from a therapist is a good move. Here are some things that help me, and might help you too. Like, all the time. If your gut is telling you “GET OUT NOW!” maybe you should take a step back. One of the problems I’ve figured out about myself is that my gut gave me signs not to trust certain people, and I ignored it. Or I ignored that person for a bit, second guessed myself, and let them back into my life without discussing the issue or reestablishing trust. Actually listening to your gut and following it is one of the hardest but more important lessons to learn for establishing trust. If a red flag goes up, don’t ignore it. Either walk away from that person immediately, or talk about it with them and take things very slowly with them until they’ve PROVEN they can be trusted. One thing I noticed about the trustworthy people: they are willing to do whatever it takes to earn your trust. Okay, so maybe the people in your past were completely untrustworthy. Maybe you were cheated on, lied to, ghosted, and completely betrayed. It makes sense that you’ve had high walls after that. Maybe you’re the type of person who always keeps people at a distance and always leaves the relationship first so you don’t get hurt. But it’s not fair to treat every person you date as guilty for the sins of your past. You need to be willing to wipe the slate clean every time you get involved with someone new. This doesn’t mean you need to trust them completely right off the bat; that can be reckless. But that doesn’t mean they’re not to be trusted at all either. You shouldn’t be treating people as guilty until proven innocent OR as completely innocent until they devastate you. You should see someone new as someone who could or could not be worth your trust and will only be proven as such after a long time of getting to know them and earning your trust. As I said earlier, my biggest issue with trust is that I trust people 0% in the beginning and then 100% once things get serious. I assume that once a person says the L word or makes a commitment to me that they are worth my full trust. The problem is that just because once I say the L word and make a commitment to someone, you can trust me not to cheat, lie, betray, or abandon you when things get rough, doesn’t mean that other people have that same policy. People aren’t the same as me, you think I would have figured that out by now? But the right way to do it (especially if you have a history of all-or-nothing trust) is to let trust build gradually over time based on people’s behavior. Get it? 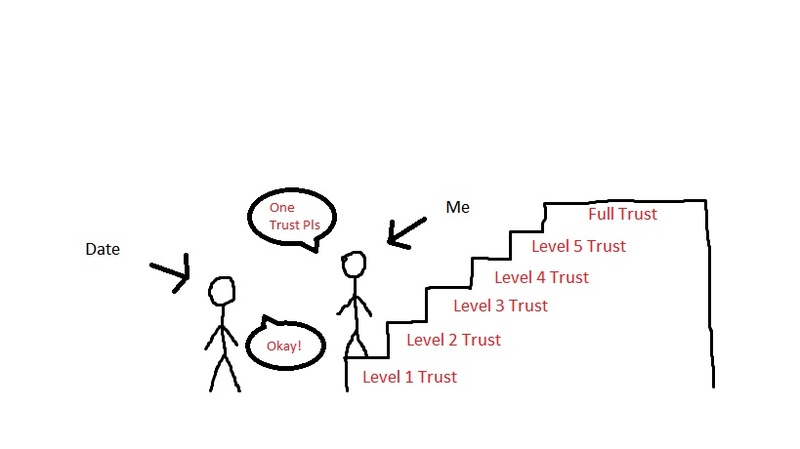 You need to climb the staircase of trust gradually after earning so many trust points! Okay…so this is not the best picture. But you get the idea, right? Trust should be earned slowly over time based on how consistently benevolent someone’s behavior has shown to be. If you want to trust someone not to cheat, they have to earn that trust over time by not cheating before you to know they can be trusted. And while that trust can be broken at anytime if they do cheat, the trust they’ve built over time may prove whether or not you can forgive them. 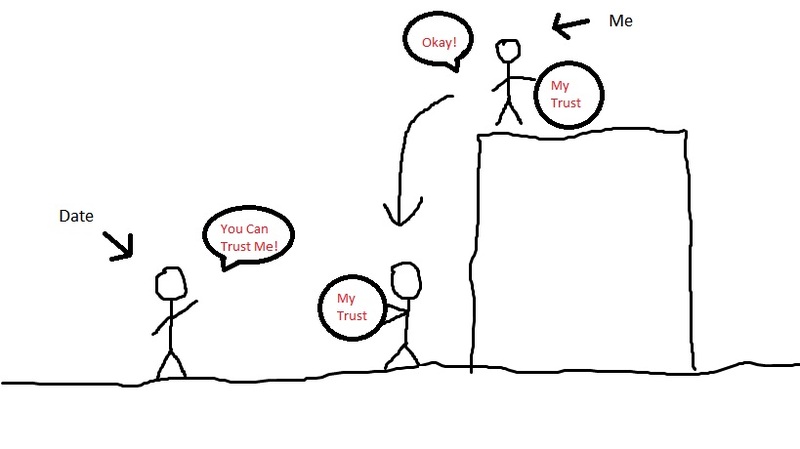 And I guess you’d also be climbing their staircase of trust at the same time, but…this was way easier to draw. It’s always important to communicate, so let your partner know what’s going on with you once things start getting real. If you find yourself falling back into old bad habits, let your partner know so they don’t get freaked out when you shut down or distance yourself. Not only can they help you work through this, but you also can’t really do it without them. It may be scary to just come out and say you’ve got trust issues (especially if, like, you have trust issues) but opening up is the first step to working through it. And as far as I’ve experienced, people who are worth your trust aren’t afraid to earn it. So that’s it. That’s all I got. You don’t have to trust people you don’t want to trust if they give you bad vibes, you don’t have to assume everyone will leave you just because the last person did (I’m lookin’ at you, SELF! ), and you don’t have to jump into trust all in at once. Let it happen gradually and listen to your gut if things change. You’ll be okay. And if not, there’s always a new lesson to learn, and that’s life.